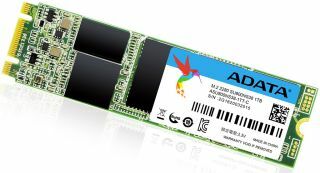 Adata today announced the launch of its Ultimate SU800 solid state drive family in the M.2 2280 form factor (22 x 80 x 3.5mm). Like the original 2.5-inch drives released a couple of months ago, the gumstick-sized variants come in capacities up to 1TB and use 3D Triple-Level Cell (TLC) NAND flash memory. These are still SATA 6Gbps SSDs so you're not going to get PCIe levels of performance. However, the rated metrics aren't too shabby for a SATA 6Gbps offering. Armed with an SMI controller, ADATA rates these drives to hit read and write speeds of up to 560MB/s and 520MB/s, respectively. And since these SSDs make a direct motherboard link without any cables to plug in, Adata also claims around a 10 percent reduction in latency. That's not something too get caught up on, though—these are basically the same SSDs, just in a different form factor suitable for anyone wanting to fill their M.2 SATA slot. In addition to 1TB, ADATA will offer the drives in 512GB, 256GB, and 128GB capacities. It hasn't said how much they'll cost and we don't see the drives showing up in any online stores just yet, but we suspect they'll be priced similarly to their 2.5-inch brethren. That would put them around $50 for 128GB, $69 for 256GB, and $130 for 512GB using Amazon's pricing (we only found one vendor selling the 1TB model, NextWarehouse, which has it priced at $290). If you're looking for a bargain, these SSDs might serve you well.